Koiwai is using non-contact 3D Digitizer CT-Scanner for Industrial use. We are also providing commissioned Scan Imaging. 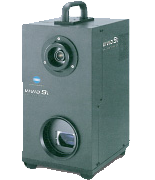 We can achieve high-speed precision measurement accuracy of + 50µm. Accuracy of testing is ideal shape casting forging stamping parts for automotive plastics. High-precision measurement of large parts up to 2.0m wide. Traditionally, integration has been difficult and relatively large part of the measured data in terms of features such as no irregularities in the shape of the measured data can be integrated quickly and accurately.